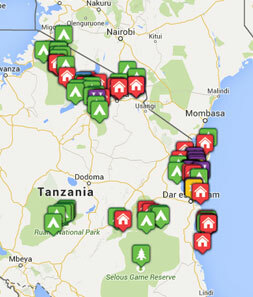 Tribes Overall: "We have had the most wonderful time in Tanzania. Everyone was welcoming and friendly and proud of their country." Guides: "Both the guides at Kuria Hills and Siwandu were excellent. Sharp vision and extremely knowledgeable. Both obviously loved what they do and were keen to share their passions." Social & Environmental Responsibility: "In Kuria Hills they were very keen to reduce the amount of plastic so there were no plastic water bottles given out. On arrival we were given metal water bottles which we were able to refill. We kept these bottles for the rest of our trip. In Siwandu we continued to refill the bottles. " A very good family hotel. Delicious food and very attentive staff. Comfortable rooms and we were lucky to be right on the beach. A good diving centre along with good water sports kept everyone entertained when not lounging by the lovely pool. A completely different experience to the Serengeti. The Lodge was mainly canvas with a wonderful view of the lake. Elephants and giraffes wondered by as did monkeys etc. The birds were beautiful too. The tents were beautiful. A step back in time with lovely dark wood furniture and a very inviting outside shower. Tea and coffee delivered as a wake up call was the perfect start to the day as were the drinks we were met with every time we returned from a Game drive. Delicious local food served in a wonderful setting high on a balcony overlooking the lake or down by the camp fire in candle light. Or lunch on the boat in the lake surrounded by hippos and crocodiles. A walking safari ending up with the most amazing breakfast or drinks watching the sun set made this a wonderful place - we were sad to leave. This was an amazing place to stay. Rich and Tansy were extremely welcoming as were all the staff. The accommodation was sublime. Extremely comfortable with wonderful views over the Serengeti. We were able to drink the water and we were given refillable water bottles to use and to keep. The food was delicious and plentiful but never too much and served on a balcony overlooking the Serengeti. The early morning game drives were exciting and the picnic breakfasts and lunches were delicious and it was wonderful sitting amongst the trees watching the elephants wonder by. The migration was far beyond what we imagined. The number of wildebeest was unbelievable. We were waved off on every Game Drive and welcomed back with cool wet flannels. A truly memorable Lodge which we were sad to leave. "We loved experiencing the whole safari life. It was fascinating seeing two totally different areas of landscapes in Tanzania and Zanzibar was the perfect place to relax."